BW photo. View from Parliament House over Albert Street towards Fitzroy. Carlton Gardens are in the distance. Shows 6 terrace houses, C & J Smith Collingwood Saw Mills and Timber Yard, C. White & Co. Brassfounders and Gasfitters, R. Hyde & Co. Marine Storemen, Baptist Church without portico. c.1865. Internet print. (SLV, picture collection accession no. H88.22/4). Description: photograph : albumen silver ; 26.0 x37.7 cm. Notes: Set of b&w photoprints at LTA 836. Contents/Summary: Shows: 1. C & J. Smith's Collingwood Saw Mills. 2. C. White & Co. brass foundry. 3. James Liddy, coach builder. 4. Baptist Chapel & School (without portico). 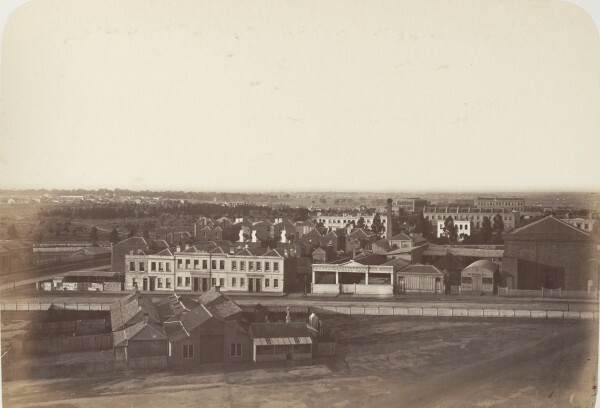 Related works: Series: Melbourne views, 1862-1879.